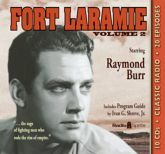 Radio's Fort Laramie goes above and beyond the call of duty in its attention to authenticity and realism, depicting the harsh existence of soldiers on a U.S. Army post in the 1880's. As Lee Quince, "Captain of Cavalry," Raymond Burr is a stern-but-sympathetic officer. Vic Perrin co-stars as Sergeant Ken Gorce, with Jack Moyles as Major Daggett, and Harry Bartell as Lieutenant Richard Siberts. Includes 20 digitally restored and remastered episodes, and a Program Guide by Ivan G. Shreve, Jr.